Enter the coupon code "eatdreamlove" during cart checkout to enjoy 10% discount off all their products. After Little Travis comes into my life, Sleep is a luxury item. There are many many sleepless nights. Hence, most of the time I always feel tired in the morning. I will try to take afternoon naps during weekends. Usually, I am a sound sleeper but there are times where it is hard to fall asleep too. Like when I feel like having a nap in the afternoon and it is a bit too bright. There will be times that I fell asleep but it is not a restful sleep. An EYE MASK will be useful in such situations. 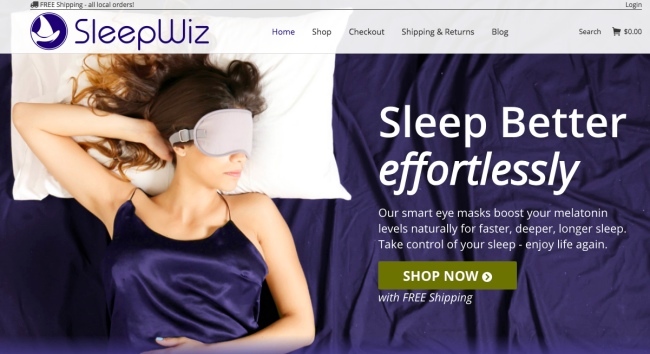 Sleep Wiz (eyemask.sg) offers eye masks that can mimic perfect nighttime conditions so that our body can enjoy proper, restorative sleep in the day. It can help us to sleep soundly even in brightly lit environments. This will help to boost our melatonin levels naturally. We can then enjoy deeper and more efficient sleep. Do not need to rely on pills or chemicals. 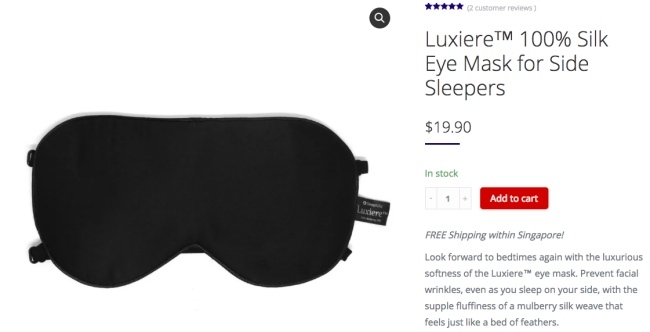 The eye mask is SOFT and SILKY SMOOTH. It's extra wide design also seal out all the light around the edges. 100% DARKNESS will stimulate melatonin secretion for restful sleep. 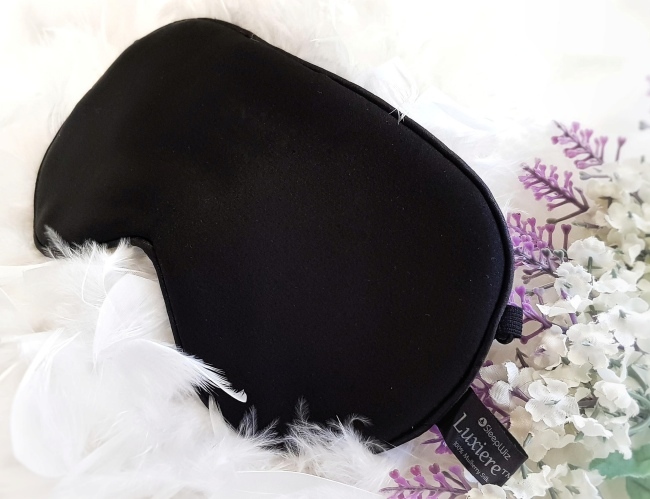 The eye mask is made with silk weaved using DreamWeave™ technology. The technology makes the silk weave impenetrable to light but still retain the natural fibre’s softness. The 100% natural mulberry silk also can help to reduce fine lines by keeping skin hydrated. There are also ULTRA-THIN, ADJUSTABLE DUAL-STRAPS which will help to keep the mask in place all night. Love it that the straps is adjustable so it won't be too tight or too loose. Great for Side Sleepers like me. It also include a FREEBIE: A pair of HIGH-DENSITY EARPLUGS which will mold to your ear canal and seal out all noise. 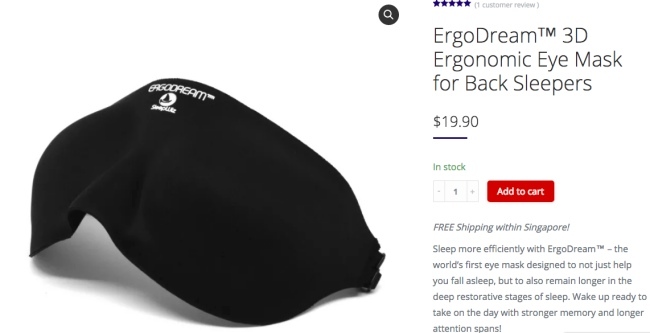 Sleep Wiz also carries ErgoDream™ – the world’s first eye mask that is designed to not just help you fall asleep, but to also remain longer in the deep restorative stages of sleep. The lightproof material also boost natural melatonin production for longer deep sleep phases. Its ERGONOMIC 3D CONTOURS allow for circulation and restorative REM Sleep. It uses VISCOELASTIC MEMORY FOAM distributes any pressure evenly across your face. There are also ULTRA-THIN, ADJUSTABLE DUAL-STRAPS which will help to keep the mask in place all night. Great for Back Sleepers. It also include a FREEBIE: A pair of HIGH-DENSITY EARPLUGS which will mold to your ear canal and seal out all noise. This is great for light sleepers especially if your sleep is often disrupted by your partner's snoring, loud neighbors or street noise. Sleep Wiz carries HIGH-DENSITY memory foam earplugs which can MOLD TO your EAR CANAL completely and comfortably. It is also WATERPROOF which makes it easy to wash clean. The earplugs also comes with a FREE CARRYING CASE to keep them clean when not in use. Above information is for reference only. Hop on to Sleep Wiz (eyemask.sg) for more information.